About the Campaign – Yes, Armenian Women Can! Armenian women have long been the cornerstone of the Armenian people. Over the centuries, however, they have evolved in their roles as caretakers to intelligent and effective employees in the workplace. As Armenia enters a new dawn and looks toward a more optimistic future, women will once again take a prominent role in the reshaping of the country and its economy, particularly in the field of technology. And it is up to us to support this mission. Information technology (IT) is one of Armenia’s fastest growing sectors and has created thousands of jobs for skilled workers in Armenia, with a myriad of posts still available. Dubbed “Silicon Mountain” because of its influential presence in the tech world, Armenia is exhibiting a 20% annual growth rate in the field, where over 450 IT companies employ more than 10,000 developers and engineers, many of them women in this traditionally male-dominated field. But this is just the beginning. 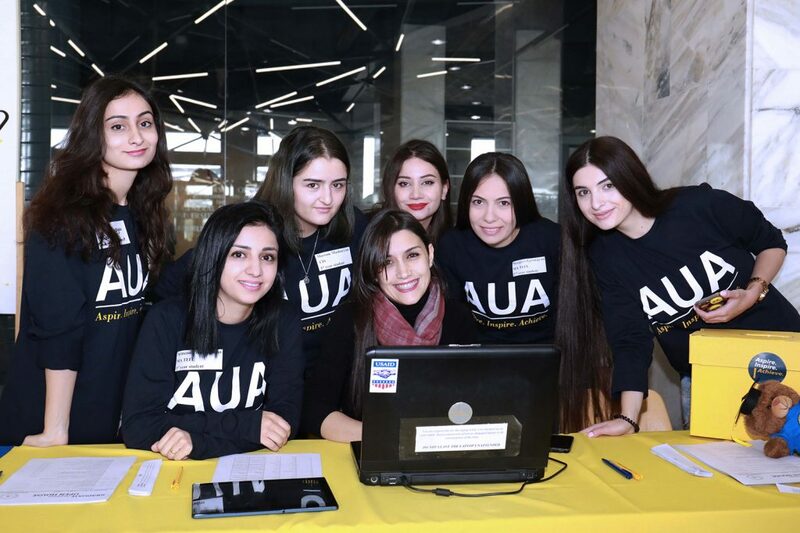 The IT field has the potential to catapult Armenia and its people onto a much more competitive economic stage and AUA has made it a priority to provide the proper education and opportunities to its students. The American University of Armenia was one of the first organizations to identity the significance of the IT field and what it could mean to the country and its female population, who can utilize their analytic acumen and intellect in order to make major contributions to the workplace. Leaping into action, AUA created an undergraduate program in the Computer Sciences (The Zaven and Sonia Akian College of Science and Engineering) welcoming everyone, particularly women, who were interested in receiving an interdisciplinary degree that applied the theories of math and computational methods to the real world. One of the program’s first students was Anush Ghambaryan, who specifically chose AUA because of this degree. Now an employee at PicsArt, a leading social network company, Anush heads the Artificial Intelligence division and has the full support of company founder Hovhannes Avoyan, an instructor at AUA whose 360 global member staff consists of 50% female employees, many of whom hold management positions. From its inception, AUA has always recognized that women are an integral part of Armenia and an important component of its future. Since the university’s founding, women have been at the forefront and have been encouraged to pursue higher education through the assistance of scholarships and tuition support. As the only U.S. accredited college in the former Soviet Union, AUA holds itself to the high educational standards of its partner, the University of California school system. Since 1991, the private university, which is independently funded, has continued to grow, now educating 2,000 students in 13 undergraduate and graduate programs. In addition to classroom learning, AUA encourages democratic values, free thinking, independent research and how to compete on the global stage. Its alumni have gone onto successful careers in government, finance, sciences and the arts. With the launch of this new visionary initiative, “Yes, Armenian Women Can!” hundreds of women will be able to study computer science and engineering through the establishment of a $2.5 million endowed scholarship fund. A kick off reception in the San Francisco Bay area earlier this year raised $75,000, conveying the deep interest in this campaign. The “Yes, Armenian Women Can!” scholarship goes beyond supporting scholarships. It transcends toward Armenia’s future through its students, such as Gasia Atashian, who came to Armenia as a Syrian refugee, seeking education and solace within AUA’s corridors. During her time at AUA, she has flourished – and as a scholarship recipient, she is successfully pursuing a degree in computer science and engineering. “Yes, Armenian Women Can!” also serves as a bridge, connecting Diasporans with their brethren in Armenia through this life-changing cause. California-based donors Ara and Laura Dirtadian created an everlasting bond with Lilia Mamikonyan, an AUA undergraduate studying computer science, thanks to the Elia Kahvedjian and Arakel Dirtadian Scholarship they named in honor of their grandparents. When Laura and Lilia met for the first time last year in Armenia, their connection was instant and they were overcome with tears of joy. Positive change comes through education. Through empowerment. And through women. Please join us in our efforts to advance our campaign and consider making a donation to “Yes, Armenian Women Can!” because Armenian women are the foundation, and the future of the homeland.